It takes a fair bit to stand out in a bottleshop fridge these days, but The Sturm is the sort of beer to catch the eye of any beer hunter on the lookout for something different. For a start, the "label", if it can be called such, is stencilled on to the bottle. Then there's the wax-dipped top. And then, if you've been lured in, you'll notice the stencil features hops and grapes. Yes, here Sam and Duncan combine their two careers in one with a beer-wine hybrid. 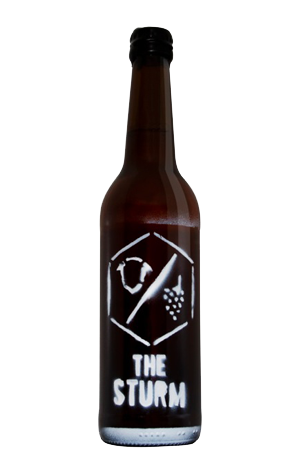 The Sturm is a collaboration with Victorian winery Jamsheed, featuring a blend of wild fermenting Riesling juice and the unfermented wort of their Damned pilsner. To this was added a blend of German hops they figured would complement the Riesling character. The result is a unique and quirky beverage that has nods to the beer side, particularly limey, citrusy characters, plus an acidity from the wine juice, and possesses plenty of funkier traits too.